Professor Jones's group is involved in the study of transition metal organometallic compounds for the cleavage of strong carbon-element bonds, with synthesis, structure, and reactivity being integral components of each project. New complexes for carrying out organometallic reactions are developed and the mechanism of the reaction is studied as a means of improving reactivity. NMR spectroscopic studies figure heavily in their work as a probe of organometallic structure. One area that has been developed in the group over the past few years involves complexes that can activate C-H bonds of unreactive aromatic and aliphatic hydrocarbons. Through a series of kinetic studies, the relative thermodynamics of arene vs. alkane activation by the 16-electron intermediate [(trispyrazolylborate)Rh(CNR)] has been established. The studies show that alkanes first bind to the metal before undergoing cleavage of their C-H bonds, and that the metal wanders along the hydrocarbon chain before choosing which bond to break. We can also tell that methylenes bind faster than methyls. Another area that is under active pursuit is the modeling of the hydrodesulfurization of petroleum using homogeneous complexes of rhodium. A simple, quantitative reaction has been discovered in which the C-S bond of thiophene is cleaved, giving a characterizable intermediate (see equation). Recent work has also shown that even the strong C-C bonds connecting aromatic rings can be cleaved. Studies indicate that the cleavage of 4-membered rings is facile and that cleavage of aryl-cyanide and aryl-acetylide bonds is possible using complexes of nickel, platinum, and rhodium. Catalytic hydrogenolysis of certain C-C bonds is even possible. 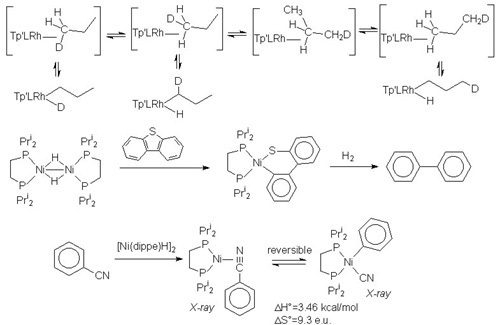 New studies with hemi-labile P-N ligands have indicated that this approach leads to compounds with enhanced reactivities towards bond cleavage reactions. Catalytic reactions are under development. We are studying the mechanism of nickel-based allylic C-CN cleavage as it applies to the production of adiponitrile in Dupont's nylon synthesis. We have published over many papers on these topics in the last 5 years (see group website).